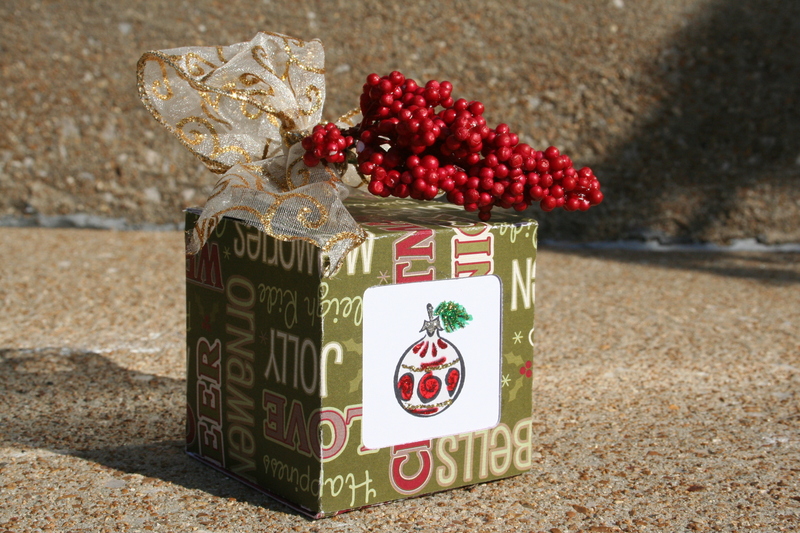 The current Tuesday challenge at Peachy Keen Stamps Challenge is to make elements used in gift wrapping. I pulled out my trusty Tags, Bags, Boxes and More Cricut cart for this challenge. I found a box and used the window option. 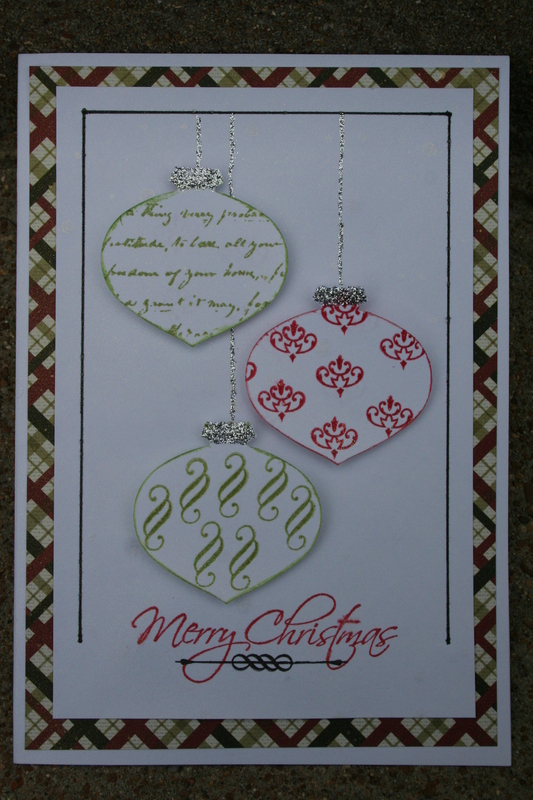 I wanted a fun Christmas design on the outside, but the pattern paper I have isn’t thick. So, I pulled out my colored card stock and cut the box twice: once in the red DCWV cardstock and once in the Cloud 9 pattern paper. Then I adhered them together before scoring. Next, I colored and Stickled (I think I just made up a word) an Inkadinkado ornament stamp, which I then placed in the window of the box. 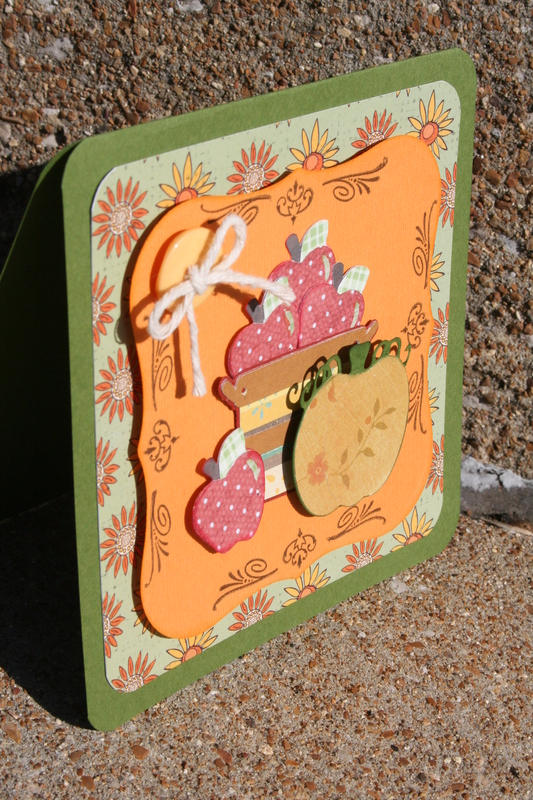 Using some festive ribbon and berries I made a topper for the card. I also decided to make a tag. 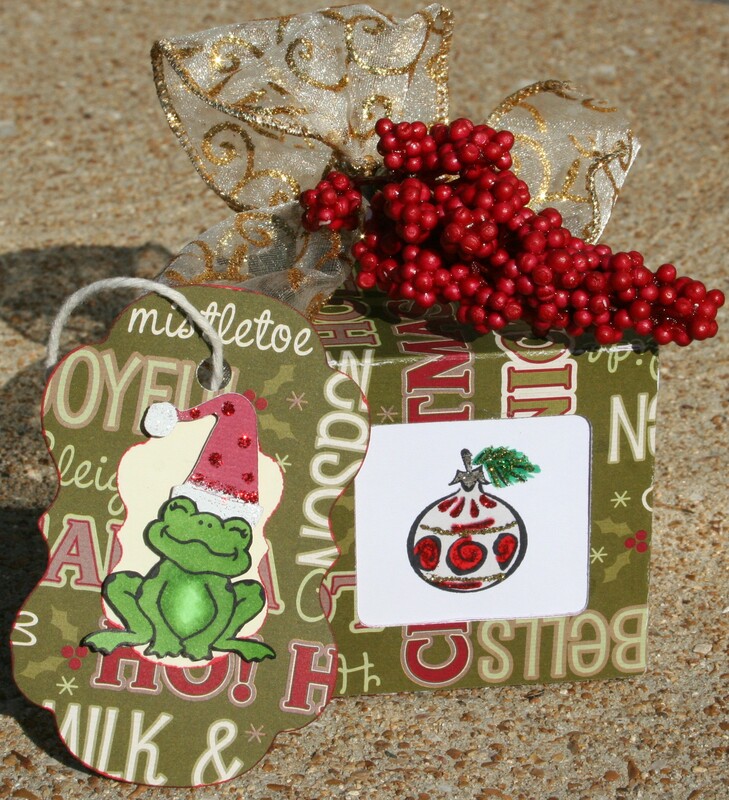 I wanted to use the Peachy Keen frog stamp on the box, but the window wasn’t big enough so I used him on the tag instead. Using my #14 Nestie labels and the patterned paper from the box, I cut out a medium-large size label. Then I cut out a medium-small size cream-colored label to put in the center. 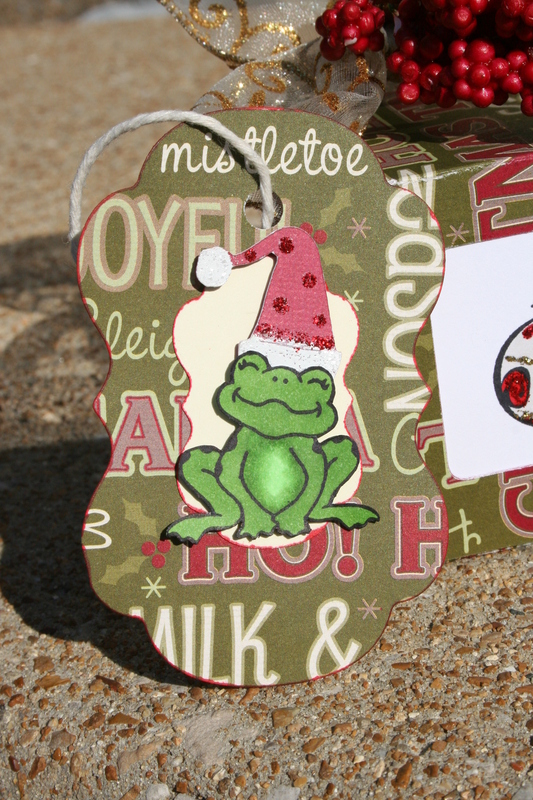 Next, I stamped my frog, colored him with my Copics and cut him out. Using my Joys of the Season Cricut cart, I cut out a hat for my frog to wear. 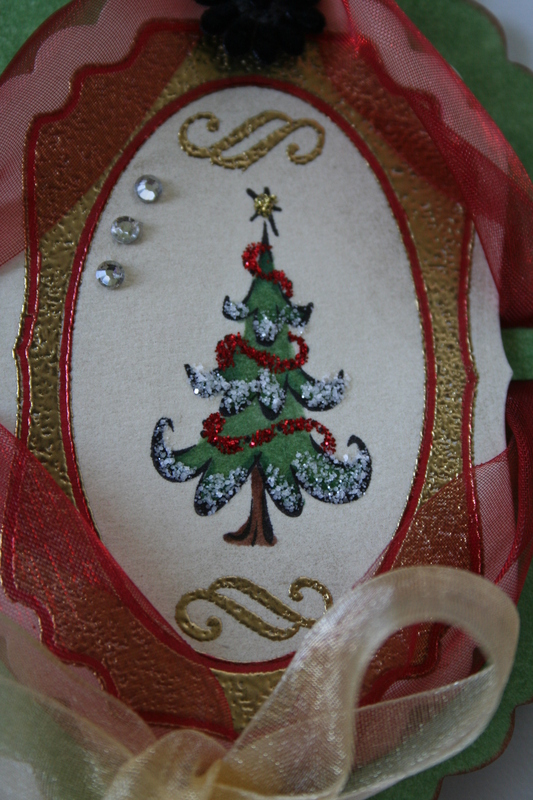 I using white embossing powder and Picket Fence Stickles for the white areas, and Xmas red for the trimmings, on the hat. Finally, I attached the hat and popped up the frog. Thanks for your kind comments and feedback. 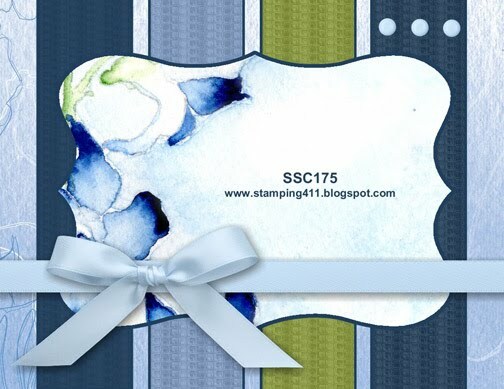 Stamping 411 has a sketch challenge this week. 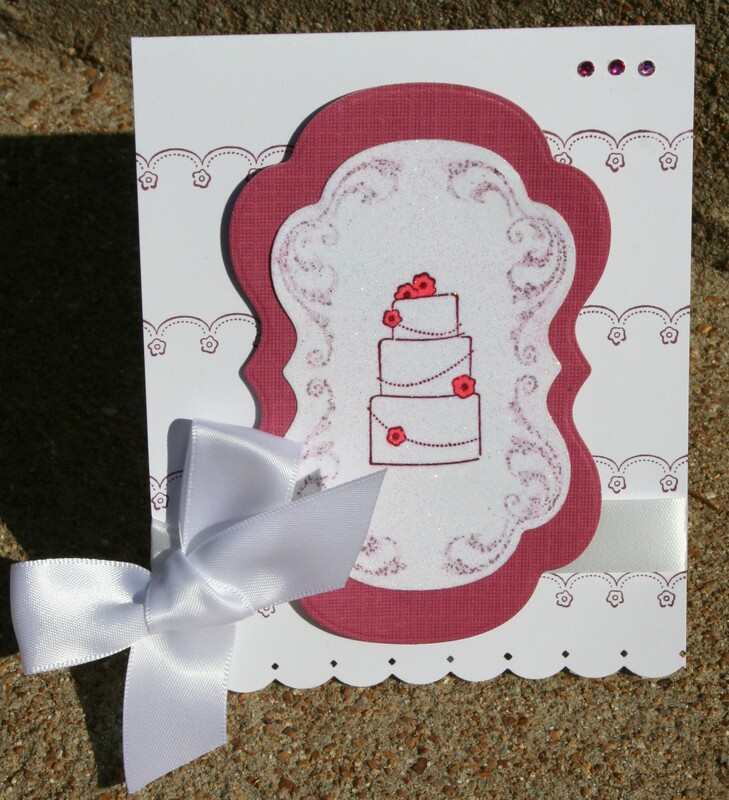 I used the wedding cake and garland from Stampin Up’s Blissful Bride stamp set. As well as, the Waltzing Mouse Vintage Labels #14 set that corresponds with the Spellbinders die cut set. First, I stamped the cake in Rich Razzleberry and colored the flowers with Copics. 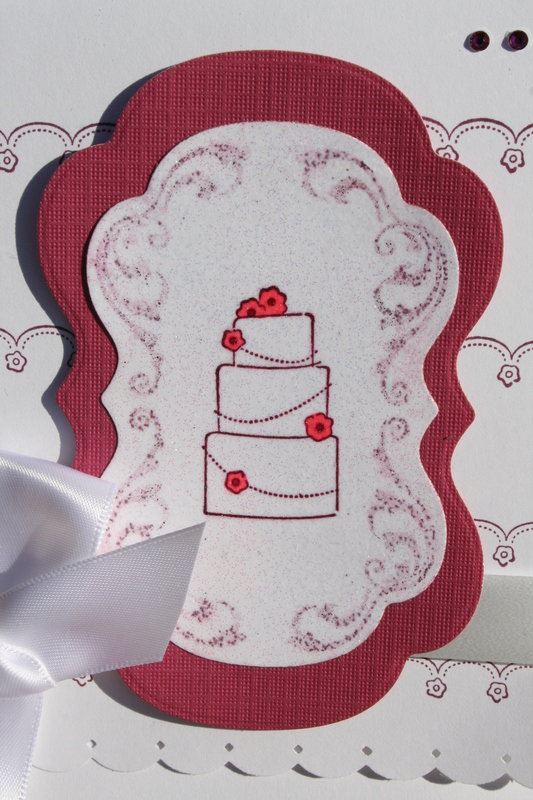 Then, using the Spellbinders Labels #14, I cut out the cake and also cut out a solid colored piece in a larger size. Next, using the Versamark champagne stamp pad, I inked the entire cake cut out and covered it in sparkle embossing powder (it’s hard to see in the photos, but very sparkly in person). 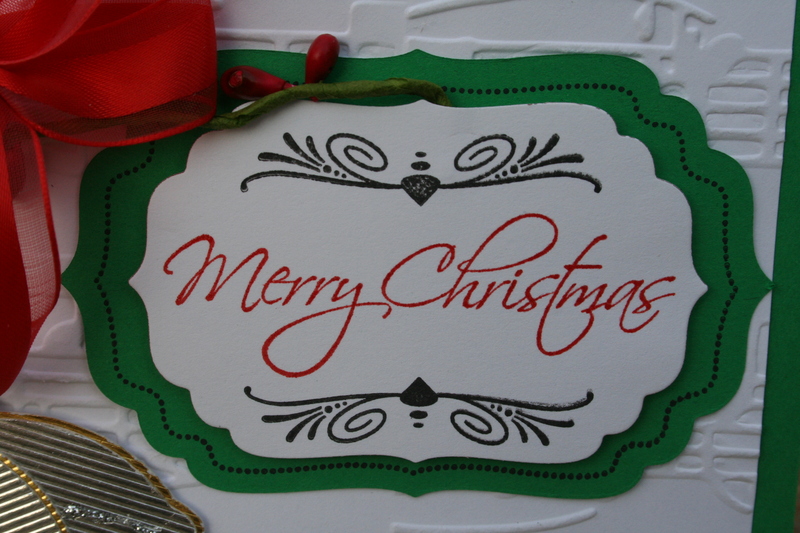 After that, using the Waltzing Mouse scroll border, I stamped over the embossing powder. It gave a really interesting effect. Finally, I adhered the cake cut out to the solid, larger cut out. For the card, I cut an 8.5×11 piece of white card stock in half lengthwise, giving me a 4.25×5.5 card. Next, I stamped the garland in Rich Razzleberry, four times on the card. Since the garland doesn’t run the full length of the page, I had a slight overlap in the middle. But since the shaped label was going to cover it, it was ok if they didn’t match perfectly. 🙂 Using my EK scallop border punch, I punched the bottom edge of the card. Using dimentionals, I popped up the label a bit on the center of the card. 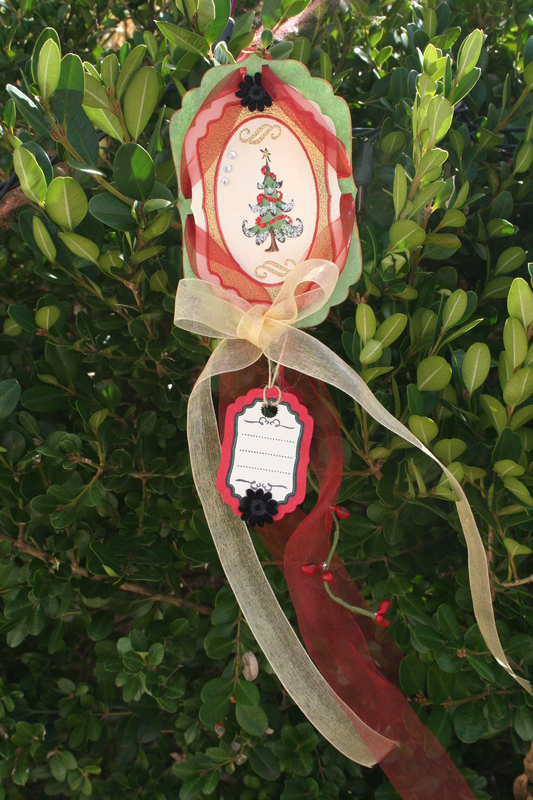 I attached the ribbon to the card before adhering the label, but tied it once the label was on. The final touch was to color my gemstones with a Copic marker that was close in color to Rich Razzleberry. I hope you like it. It’s my first time entering the Stamp 411 challenge. I appreciate all your comments and feedback! Waltzing Mouse blog is having a contest asking us to make a “fancy” tag. 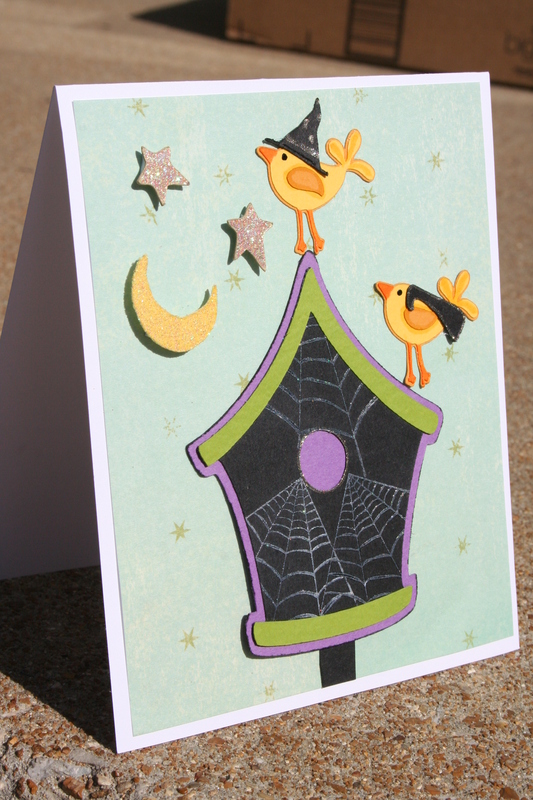 I used Spellbinders labels #4 for all the shapes. All stamps, except for the Christmas tree, are from Waltzing Mouse. 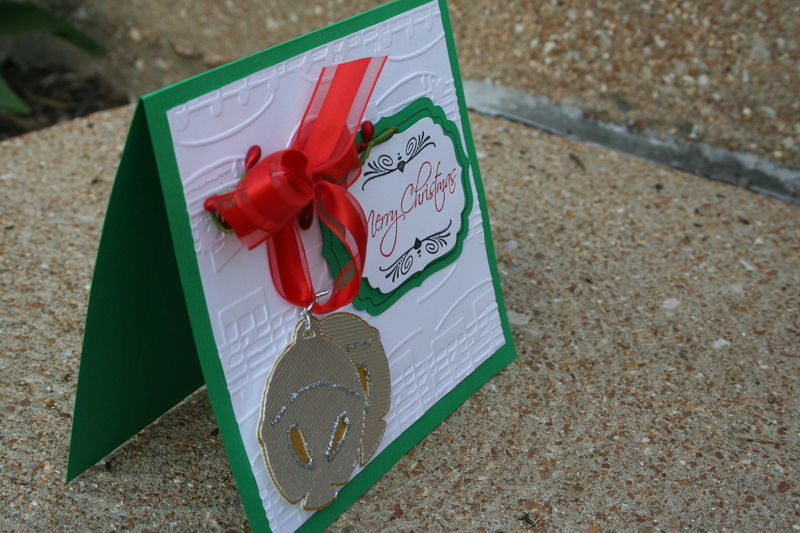 I embossed the stamped frame and little twirls on the main tag with Ranger gold embossing powder. I really like how shiny it is! The tree is from Inkadinkado. All the coloring is done with Copics, including the outlining on the frames. I used Gold, Xmas Red and Picket Fence Stickles on the tree for the star, ornaments and flocking. The three little gems are by Stampin Up. Using a punch from Stampin Up I made eight holes through which I threaded the red ribbon, then added the gold ribbon at the bottom. I found the ribbon and black velvet flowers at Archivers. 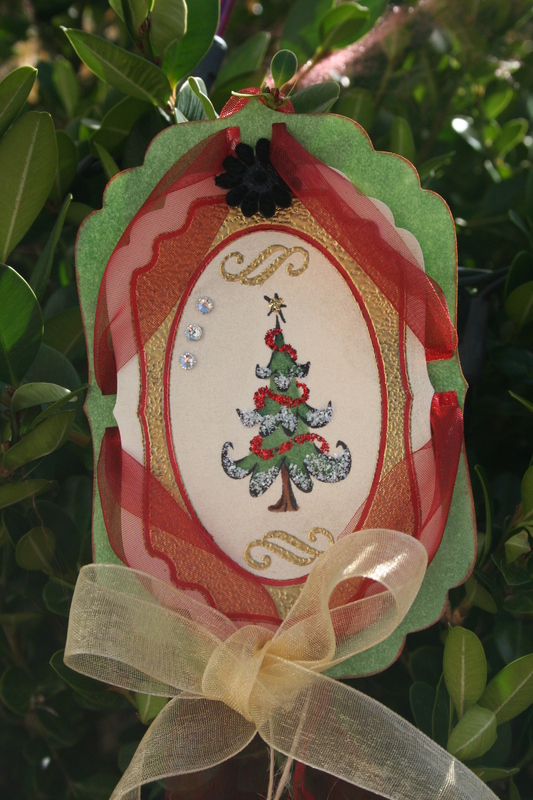 The green “branch” with red berries is from my home decor Christmas stash. It was really windy when I took this picture! 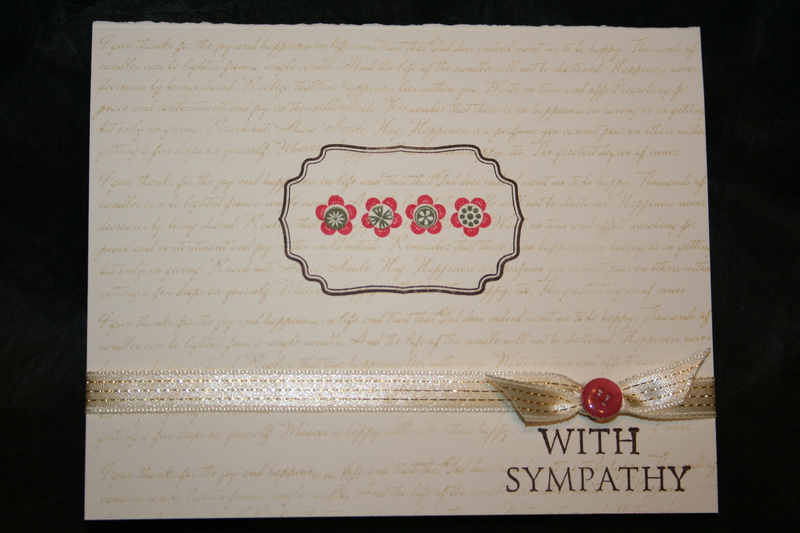 I made this sympathy card using the sketch from Waltzing Mouse Sketch Challenge. I used Antique Linen to ink up my new text it stamps for the background. Then I used my Vintage label #4 stamps for the outline. 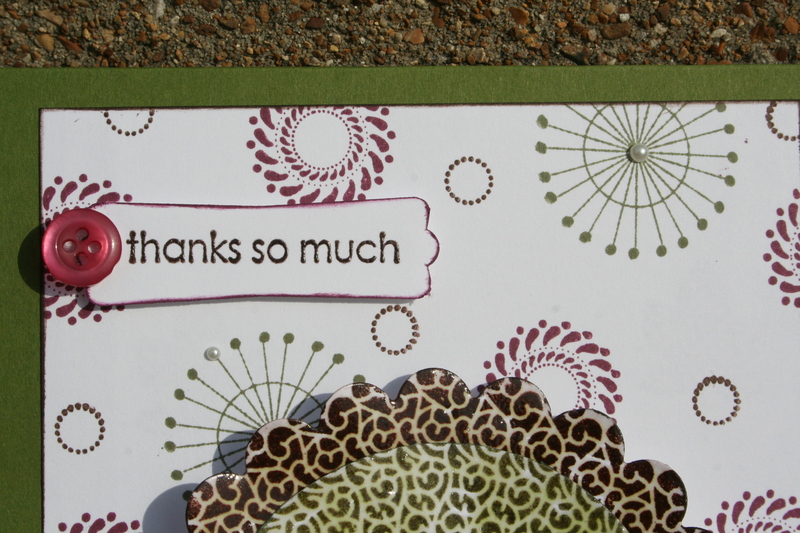 The flowers are from Stampin Up and the sentiment is from Unity. Finally, I tied a ribbon around the card and sewed a button on (I was afraid the button would fall off if I used adhesive). It’s simple, but I don’t feel you want a lot of fluff and bling on this type of card. Welcome! This is my first Blog Waltz, and I am very excited! I really wanted to use the new stamps I ordered last week for this project, but the “snail mail” is moving at its typical pace. Therefore, I am using bits and pieces from Vintage Labels #1 and #4 with my Nestie. 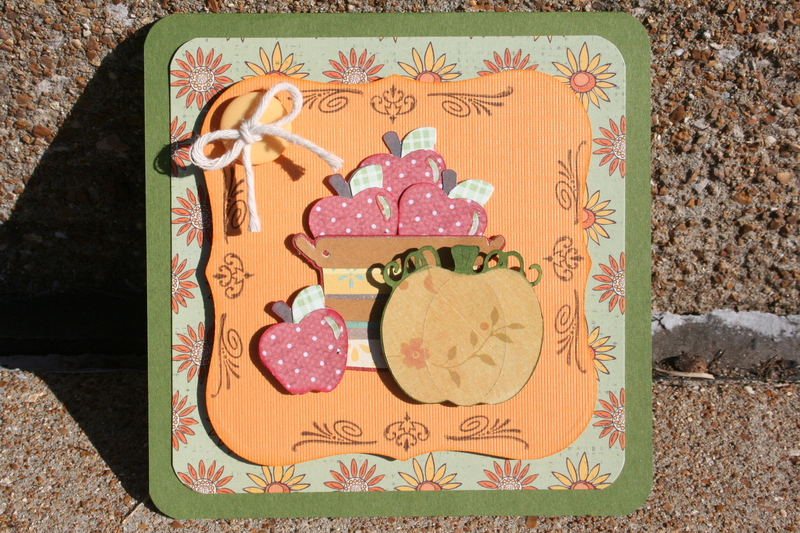 The basket and apples are from the Doodlecharms Cricut cart. The apples were cut three times with different papers and pieced together. The final touch was Glossy Accents to make part of the apple shiny. The pumpkin is from Everyday Paper Dolls. I used pattern paper from Cloud 9, My Minds Eye and K & Co. 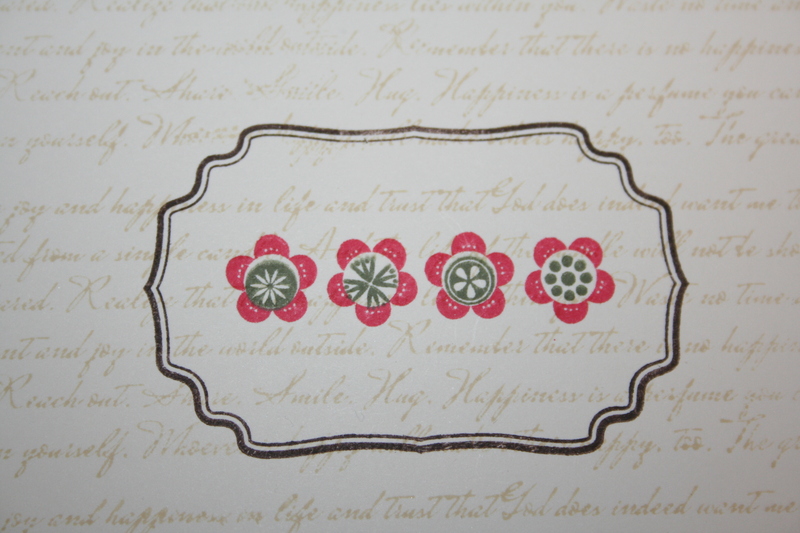 Always Artichoke, Chocolate chip, Rose Red and Pumpkin inks from Stampin Up for the stamps and inking the edges. Thanks for taking turn around the dance floor with my blog! Next month I look forward to showcasing more of Waltzing Mouse stamps! See you then, if not sooner! I thought for several days about what I wanted to do for this weeks 2S4Y sketch challenge. I spend a lot of time driving during the day for my job, which gave plenty of time to plan it out in my mind. I used a Hero Arts Medallion stamp which I stamped in Stampin Up Chocolate Chip, Always Artichoke and Rich Razzleberry inks. 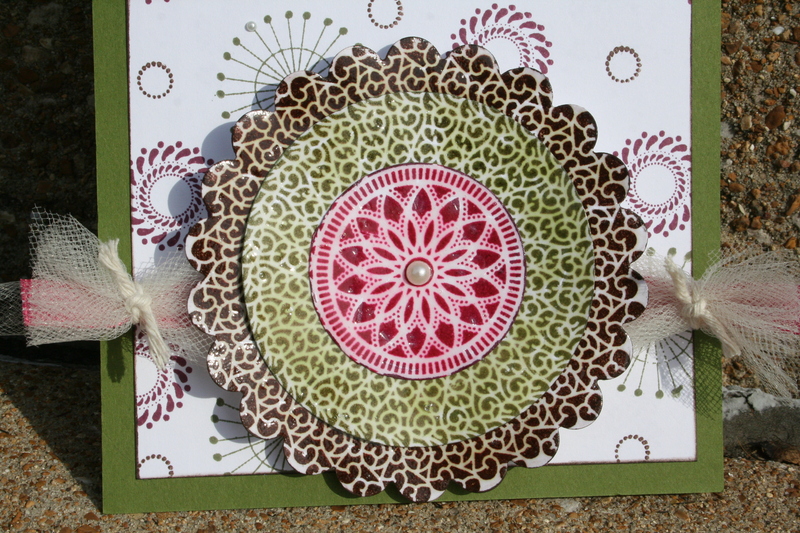 Using a Spellbinders Nestie scallop circle and regular circle I cut out the brown and green medallions. 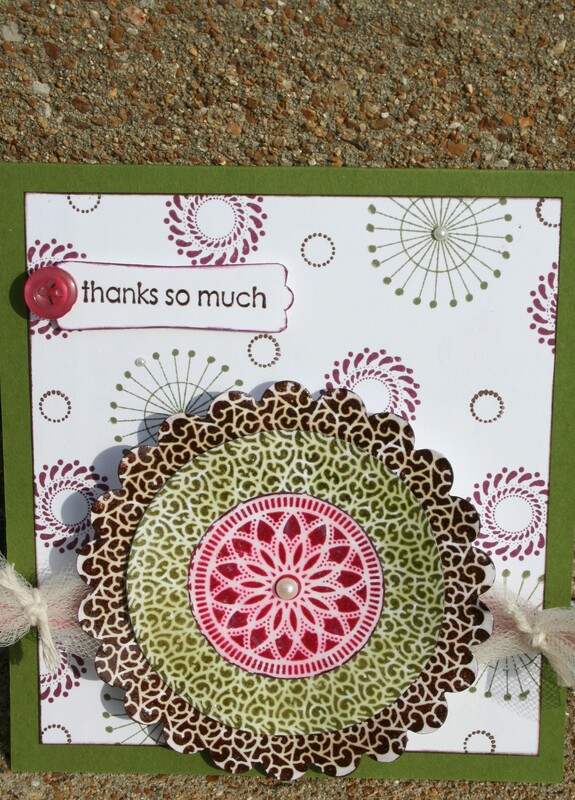 Then I used a Fiskars circle part to cut out the center of the Rich Razzleberry medallion. Next, I covered the cut out pieces in Glossy Accents. While I was waiting for that to dry I made my own background pattern paper using circular stamps from Stampin Up, Unity and Waltzing Mouse and the previous ink colors (I went through several drafts!). The ribbon is two pieces of taffeta and a purplely-pink color of ribbon tied together with twine. 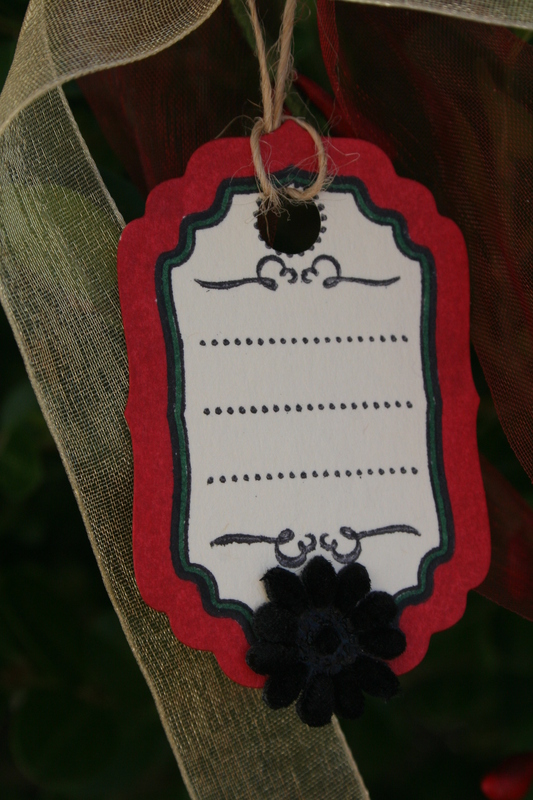 The little tag is made using a Stampin Up sentiment and punch. I popped it up with dimentionals and placed it so the button was “in” one of the background circles. Once the Glossy Accents dried (they really brightened the color of inks) I lined up the circles, adhered them together and popped them up over the ribbon. 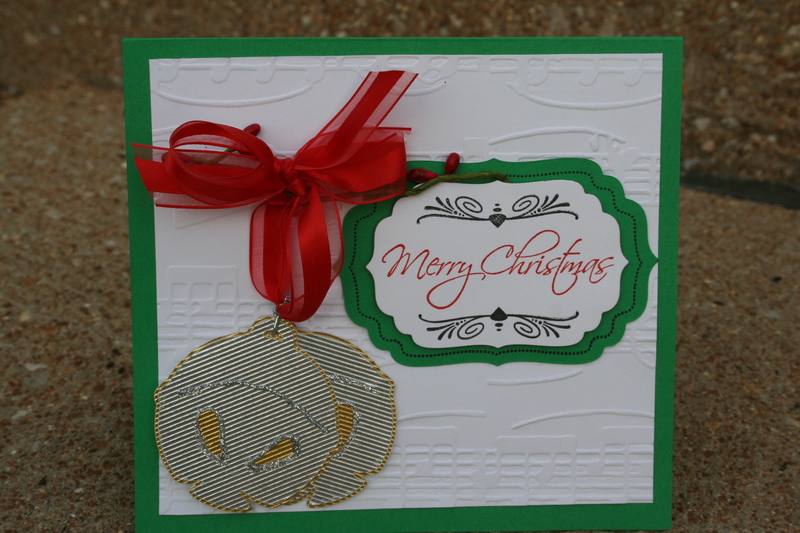 Finally, I added three Stampin Up pearls: a big one in the center of the medallion, a medium one in the center of one of the background circles and a small one on an outer part of a background circle. 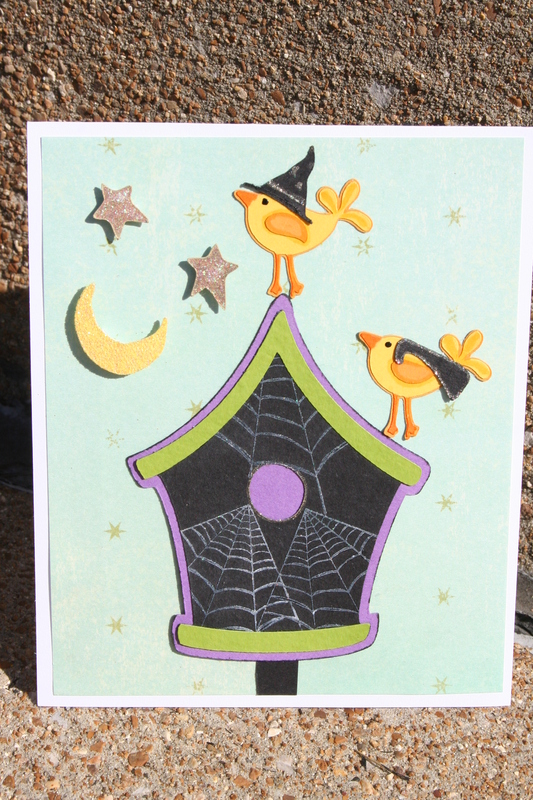 I am also entering this card in this weeks Polka Doodles challenge since I “made” some of my of my items (background paper, medallion), which was the theme this week. Thanks for looking! I appreciate your comments! Wow! I came in second for the Polka Doodles hidden element challenge. I am so excited! This is the first challenge I have placed in. If you want to check out what I won for click here. My Pink Stamper is having a challenge to make a winter project. Since I have been gone all weekend I decided to make a card. I wanted to use my music note Cuttlebug folder so I was trying to think what would go good with it. Silver Bells, silver bells (be glad you can’t hear me singing!)! 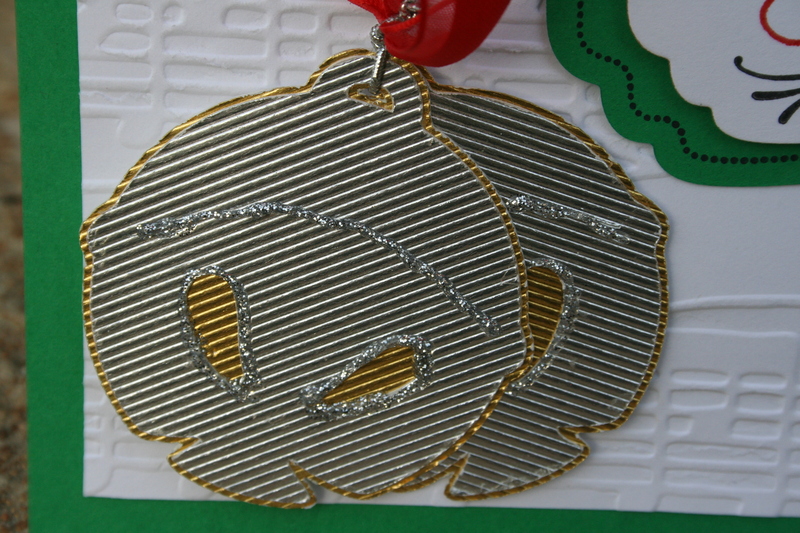 I found some bells on the Joys of the Season cart and cut them out of AC silver and gold foil paper. Then I cut out two Nestie shapes and stamped them with Waltzing Mouse Vintage Label 14 Stamps and Stampabilities sentiment stamp. I popped up the inner Nestie piece. 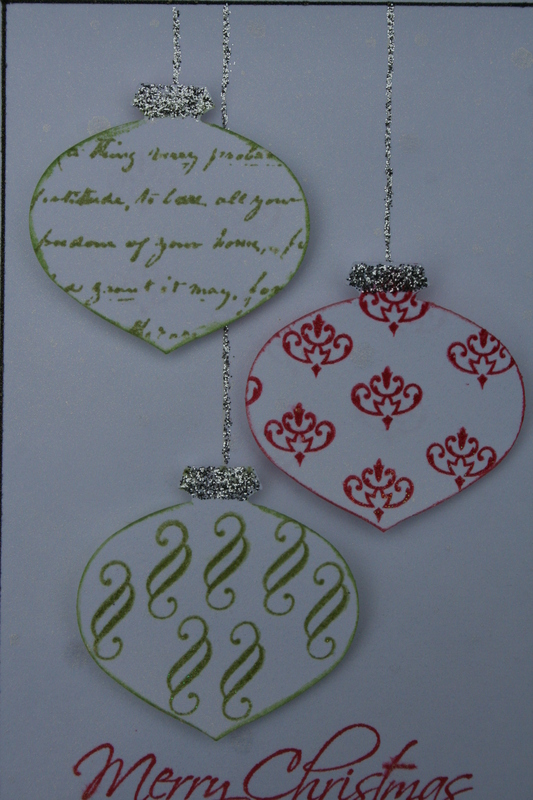 I outlined parts of the bells in silver Stickles, added a piece of “holly” to the card and tied my silver bells to it. Pretty simple, but I thought it turned out pretty good. Thanks for taking the time to look, I love comments!